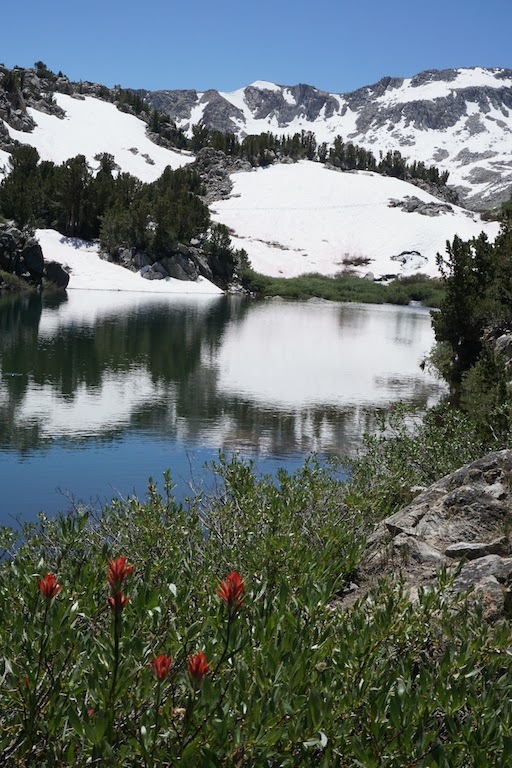 Wanda Lake (11,426'), still largely frozen in late July of this high snow year. Situated west of Muir Pass (11,955'), it is named for one of John Muir's two daughters. Helen Lake (11,617') sits on the east side of the pass and is named for Wanda's sister. 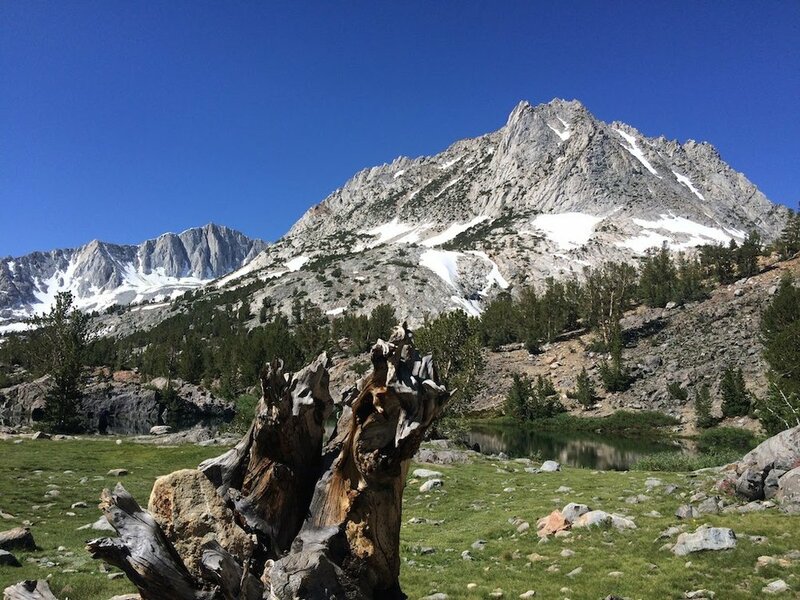 If the John Muir Trail is the crown jewel of the Pacific Crest Trail, then the Evolution Basin and Valley are perhaps the most strikingly-sculpted gem to be carefully placed in that jewel. One bite of the Evolution area is liable to infect any passerby, causing even the most mileage-minded thru-hiker to slow down and soak in the absurdly stunning combinations of rock, water and sky. 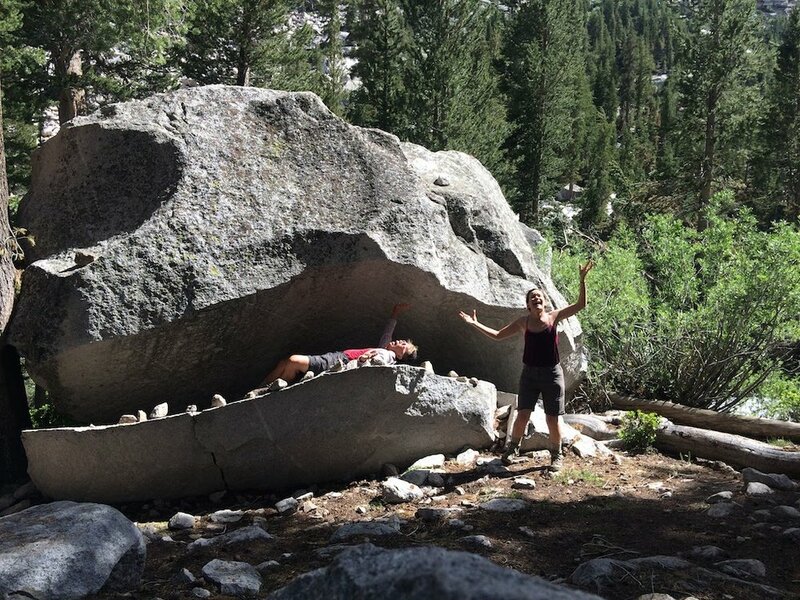 We got bitten by the Evolution bug on our 2015 trek of the John Muir Trail and were determined to go back. We opted to pay this gorgeous stretch a second visit via the South Lake to North Lake (or North Lake to South Lake) semi-loop. The route begins and ends at trailheads accessed via Highway 168 near Bishop. 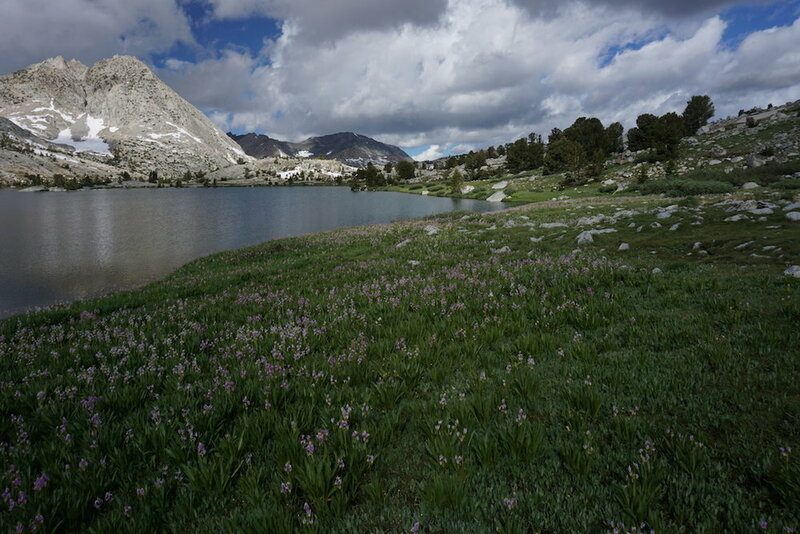 It starts at South Lake (9,825') and reaches its highest point at Bishop Pass (11,972') in the first six miles, before descending into the scenery of Dusy Basin. 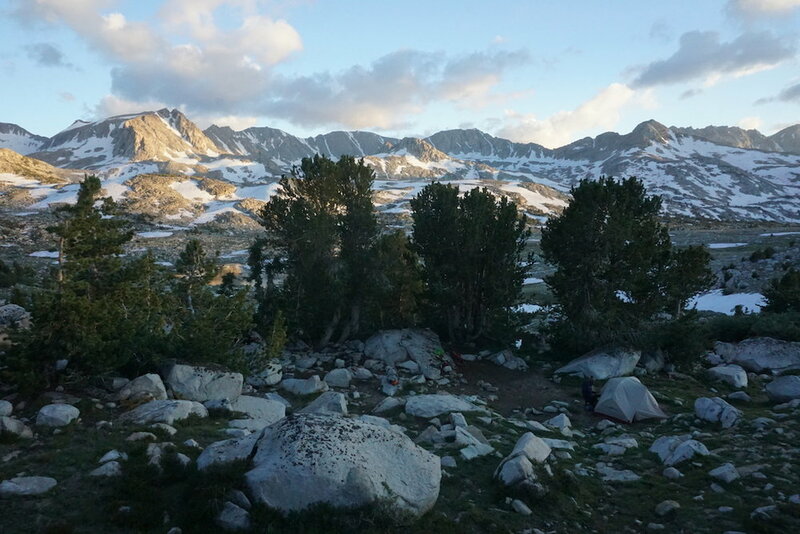 A steady descent then leads into Le Conte Canyon (8,750'), where the trail intersects and joins the John Muir Trail. Following the canyon the trail ascends north and then west toward Muir Pass (11,955'), staying above 11,000' for a few stellar miles along Evolution Basin. As the trail descends it enters the picturesque Evolution Valley, hitting the lowest elevation of this route (8,050') near the junction of the South Fork of the San Joaquin River and Piute Creek (more of a raging river in this high-water year). Leaving the John Muir Trail, it climbs steadily up Piute Canyon, leading to pretty Humphreys Basin before topping out once more at Piute Pass (11,423'). The final stretch descends five miles to the North Lake trailhead (9,360'). In all, we hiked 63.6 miles in 6 days, climbed 12,683' and descended 12,468'. Looking up toward Bishop Pass. Along South Lake trail on the way up to Bishop Pass. The trail partly submerged along Long Lake, on the way up to Bishop Pass. One of many trail crossings. I happened upon these resting bucks while looking for a campsite. The surprise was mutual. A semi-frozen tarn in Dusy Basin, close to camp. The highest peak is North Palisade, behind which is the Sierra's largest glacier. Natural air conditioning from Dusy Branch along the switchbacks down to Le Conte Canyon. Dusy Creek sliding down the granite toward Le Conte Canyon. First evidence of early-season avalanche damage, along Le Conte Canyon. The famous Rock Monster along the JMT, near Big Pete Meadow. SNOW. We've covered many Sierra routes over the years and had never seen this much snow linger this late into the summer. The presence of snow made already gorgeous scenery even more picturesque, but also made for challenges in terms of route-finding as portions of trail were buried under many feet of snow. Muir Pass was flanked by snow for some 3 miles on either end. Though this made for a slog, we didn't mind as the views were magnificent. Even with traction devices (Microspikes) and snow baskets on our trekking poles, we postholed, slipped and took a few spills, gathering scrapes and bruises like battle wounds. Boot paths showed us the way most of the time (sometimes correctly, sometimes not). Whenever we thought we were off-trail, having a GPS unit in addition to a map and compass helped confirm we were roughly where we needed to be. WATER CROSSINGS. By far the most dangerous impact in a high snow year is high creek crossings. 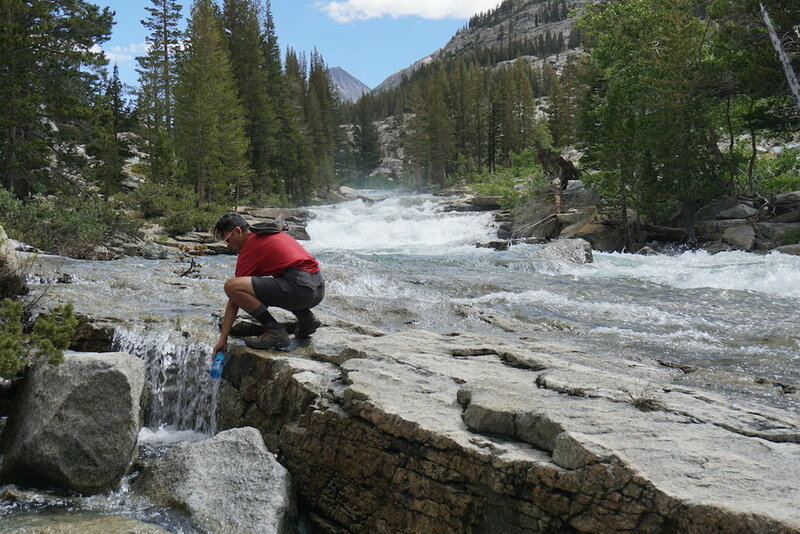 Sadly, high water claimed several lives in the Sierra this hiking season. We had about a dozen significant water crossings on this route, and had we been on the trail a month earlier, we would have been literally up to our necks in trouble. When we hit the trail in late July, the crossings were all manageable, though many still required extra care. We switched into our creek-crossing shoes for over half of these crossings and made good use of our fully-extended trekking poles, both to probe the depth of our next steps and provide stability in swift currents. Though none of the crossing was deeper than about 3 or 3 1/2 feet, several were rapid enough to knock a hiker down. We took our time finding the best place to cross (sometimes not at the main crossing, but up or downstream), and then made sure to have three points of contact at any moment (either two feet and one pole, or two poles and one foot). We also put our electronics and other important items in drybags whenever we thought a crossing seemed risky enough to potentially knock us down. AVALANCHE DAMAGE. We encountered several stretches where trees had been snapped, uprooted, damaged or swept downhill, evidently due to avalanche damage. In many cases, the needles of evergreen pines still retained some of their verdant color, indicating a recent event, likely in the early season. The damage of dozens or more trees was often strewn over and around the trail, making navigation around downed trees challenging. Stretches that were most obviously impacted included Le Conte Canyon near Big Pete Meadow and Piute Canyon between West Pinnacles and East Pinnacles creeks. MOSQUITOES. These bloodsuckers were ever-present, sometimes in small numbers and sometimes in thick clouds. I collected some 50 bites over the course of our six days, maybe more. We pre-treated our clothes with permethrin (mildly effective), sprayed DEET when it got bad (fairly effective), and otherwise practiced the philosophy of giving them a chance and then promptly reincarnating them. 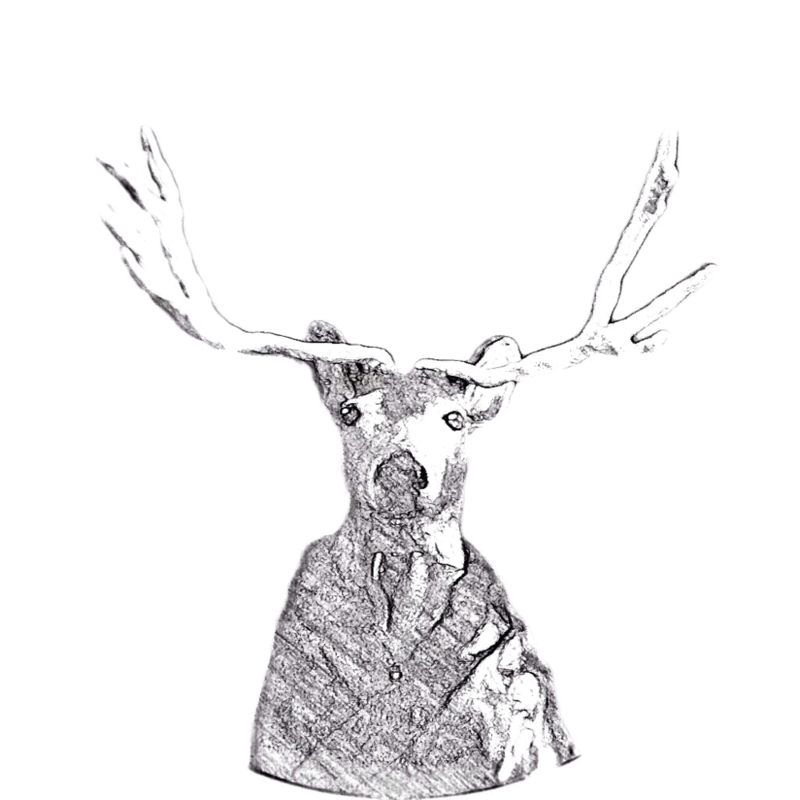 FLORA AND FAUNA. Not all impacts of this high snow and water year carried risk. Some greatly enhanced the trip. Wildflowers were stupendous as soon as we hit the trail and seemed to thrive at almost all elevations, from the low canyons to the high meadows. Wildlife too seemed to be living at its fullest. We saw a healthy buck and its young fawn relaxing under a tree, spotted a family of sooty grouse teaching their chick to explore among the rocks, enjoyed the songs of many different birds, and apparently just missed seeing a bear cub off the trail. Wanda Lake in its frozen glory. Snowmelt on the way up to Muir Pass. The beginning of about 7 miles of snow cover around Muir Pass. Suncups and "watermelon snow," which is caused by algae. Crossing the inlet to Evolution Lake. Glacial striations by Evolution Lake caused by a moving glacier. A carpet of wildflowers, which the mosquitoes also apparently enjoyed. Maneuvering around trees felled by an avalanche along Piute Canyon. The high plains of Humphreys Basin at 11,000', with Mt. Humphreys (13,986') in the distance. Our final night on the trail was J's birthday. A southbound hiker told us about this hidden campsite earlier in the day. It was perfect. Can you see our tent hiding among the rocks? A Belding's ground squirrel focusing intently at our camp. He kept squinting as if to sharpen his sense of smell. A satisfying post-trek meal and beer at Mountain Rambler Brewery in Bishop with our Kiwi bud Francis, who we met in Peru earlier this year. Francis is taking a year to travel from Antarctica to the Arctic. Garmin eTrex 30 GPS: We used our trusty Garmin to create this map and route, with camp locations included. 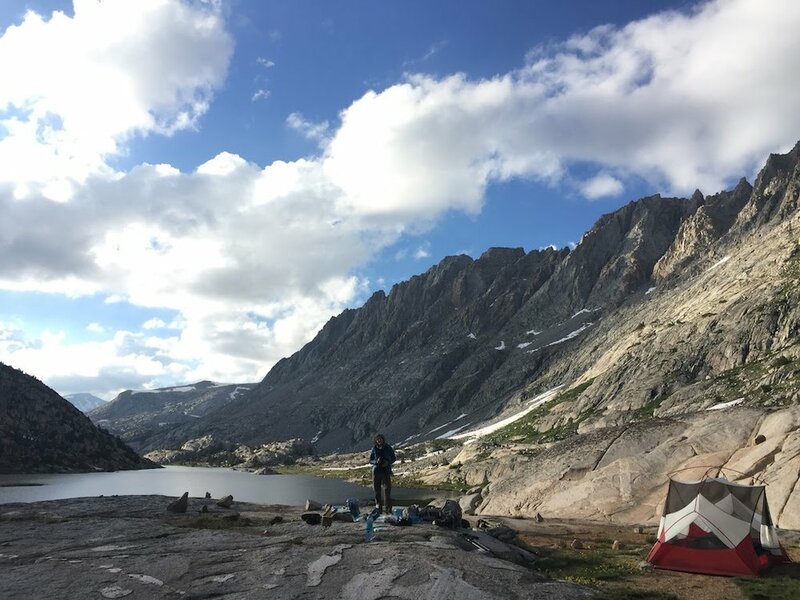 We loaded campsite waypoints from Elizabeth Wenk's John Muir Trail: The essential guide to hiking America's most famous trail, which makes finding a campsite along the JMT very easy, especially at the end of a long day. Tom Harrison's Bishop Pass - North Lake/South Lake Loop map: it was in my cargo pocket at all times (except when it was out being used). Backpacking California (Wilderness Press): classic book for trail descriptions and interpretation. Like having a naturalist hiking along with you. DeLorme InReach Explorer: we once more brought along our trail angels Mary & Robert's 2-way satellite communicator just in case. We used it let family know we hadn't been swept down a raging river, and to get a weather forecast for our GPS location on demand through this free service (incoming message fees still apply). 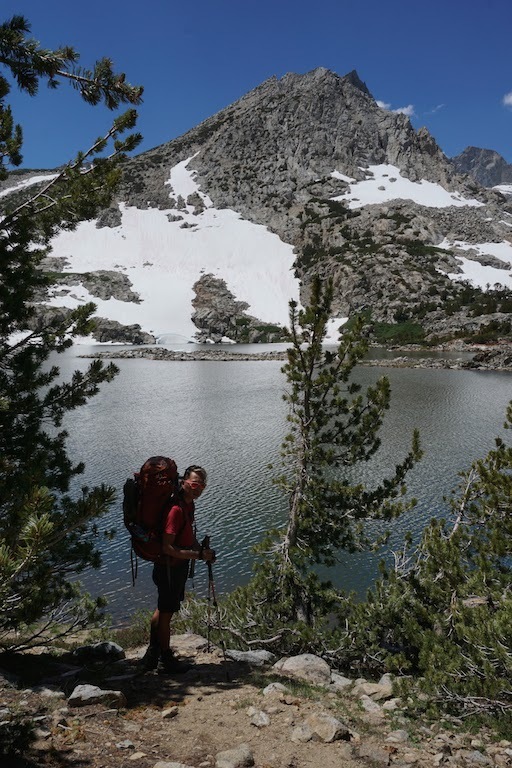 Sierra Mapper: in pre-planning, we used this free interactive mapping tool created Adam White to determine our rough daily itinerary including trail miles and elevation gain/loss.